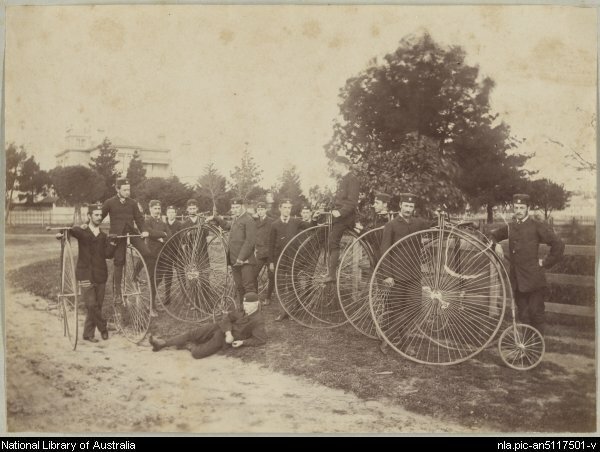 Hipster/cyclists (see above) from The Melbourne Bicycle Club did the first ever climb to KingLake by bike 130 years ago on September 30, 1883. Some of us are doing a ride on Sunday from Melbourne to KL to commemorate that ride. Starting in Melbourne at 6:30AM Sunday on September 29 at Carlton Gardens and then meeting up with others at the Research roundabout at 8:00AM going via Heidelberg. Then its off to Smiths Gully (Queenstown, which is between Smiths and St Andrews). From there up to Kinglake and back to Melbourne via Queenstown “after a short stay”. Alain and a couple of others are also going to do the ride on Monday if you’re interested. He’ll be starting out in Eltham.